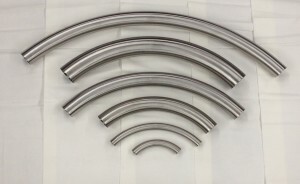 Sanitary Solutions is your specialty source for sanitary stainless custom fabrications such as Sweep Elbows that are 3A, Spool Pieces, Instrument Tees, Dip Tube Assemblies, Large Diameter Fittings Sized and Polished to a Sanitary Finish, Manifolds and those napkin sketches that come up and you need the job done correctly and on time. When you have a requirement to move liquid or slow moving material along a long sloping area such as sugar, honey, molasses, pharmaceutical liquids or in poultry or meat facility and you need a long sweep elbow whether it be a 30°, 45°, 90° elbow, then we are your source – call our team at 1-888-909-3569 or 1-855-640-7871 and let them know what the length is and if you need tangents to orbital weld and let us do the rest. The sales team at Sanitary Solutions will take the time to go over the details with you, provide you a quote, drawing and lead time that you need. We will not sell to your customer, but we can blind label/ship to them or to you and supply you with the necessary documentation to meet you and your customer needs because it will be done right the first time. We hope this gives you some insight as to our capabilities when it comes to a custom fabrication. Send us a drawing or a sketch of what you are looking for with a quantity and alloy and allow us to do the rest. In fact, if you have the time and the quantity, let our sources across the pond quote for the very best prices. This way, we can stock from our warehouse when you need the inventory. Sanitary Solutions is your source for any type of Custom Fabrication from a specific fitting on a CAD system to a napkin drawing.